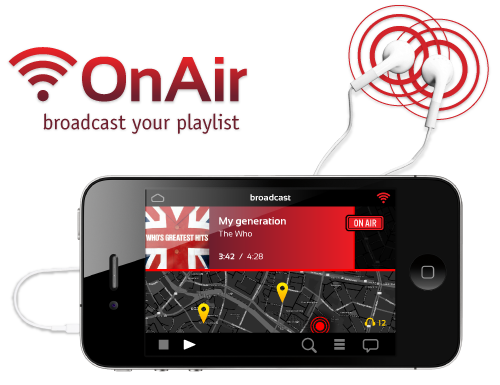 OnAir is a smartphone application which allows users to create playlists and share live music listening. The service transforms an ordinary smartphone into a radio station, allowing the user to broadcast music as well as to catch other available broadcasts. It aims to be a new way of thinking and living music. Music is ubiquitous, a part of everyday life. Every time I see an MP3 player and a pair of earphones I always wonder what kind of music people around me are listening to. Hence OnAir, an app which allows users to overcome the isolation of earphones in favor of shared listening. With OnAir, listening to music improves and transcends the limits of earphones in a social and collective way. OnAir is a music streaming service which uses music as a vehicle for social relations. Designed to create a community of music lovers, it uses a range of tools such as a chat, a follow system and a GPS localization. The app facilitates relationships between people by allowing them to share musical preferences and discover those of others. The app uses a large database with millions of music tracks and artists–accessible any time, anywhere–which people can use to create and share their favorite playlists. The overall architecture comprises three main sections: broadcast, to share and spread one’s own live playlist; onair, to listen to a playlist proposed by other users; and discography, to play back all saved playlists. This function allows you to share your music listening of the moment with others users. In this section you can create a new playlist looking for songs and artists from the music database which will be available in streaming. The playlist you are creating, while listening, is broadcast live and becomes ​​available for live listening to all users in the onair section. The onair section is listening to music that is live broadcasted by other users who are meanwhile creating and sharing their playlist. This function is complementary to broadcast; they work in parallel and simultaneously. The discography is the archive of all playlists. This archive is divided into two sections: one with the playlist which you have created and saved, the other with all playlists created by other users. Both playlists can be listened to via indirect streaming, so without the presence of active users, and are also available to be played again in the broadcast section. This manual is the final report which describes the starting research on music services and the design process which led to the app’s final structure and interface.